The Ghirardi WaterSmart Park, a new idea for League City. We are working with the City of League City on a very exciting and ground breaking project, the Ghiardi WaterSmart Park. This Park is currently under construction on Louisiana Avenue in League City, Galveston County, Texas. Scheduled for completion next month, this space is much more than just a park. The 3.75 acre neighborhood space has a pavilion, walking trails and a playground. It also has special features including rain gardens, a cistern to collect rain water for irrigation, a green roof on the pavilion and WaterSmart landscapes. The park is also home to the 100+ year old Ghirardi Oak tree that was relocated during the reconstruction of Louisiana Avenue in 2012. 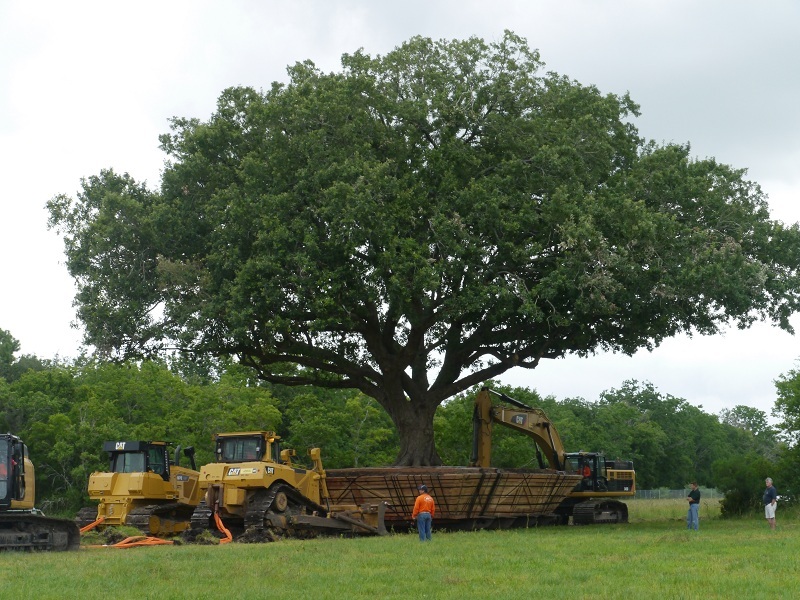 Crew moving the 100+ year old Ghirardi oak tree. The Ghirardi WaterSmart Park design is based on the three principles of WaterSmart Landscapes: water conservation, water quality and habitat for wildlife. These three elements are integrated with typical park features to create a unique and water conserving park. Water Conservation: The recent years of drought have served to remind us that water is precious. Collecting and using rain water for irrigation instead of turning on the hose, using native plants that are adapted to our unique climate and having more native areas and less lawn are all water conservation strategies that will be used at the park. 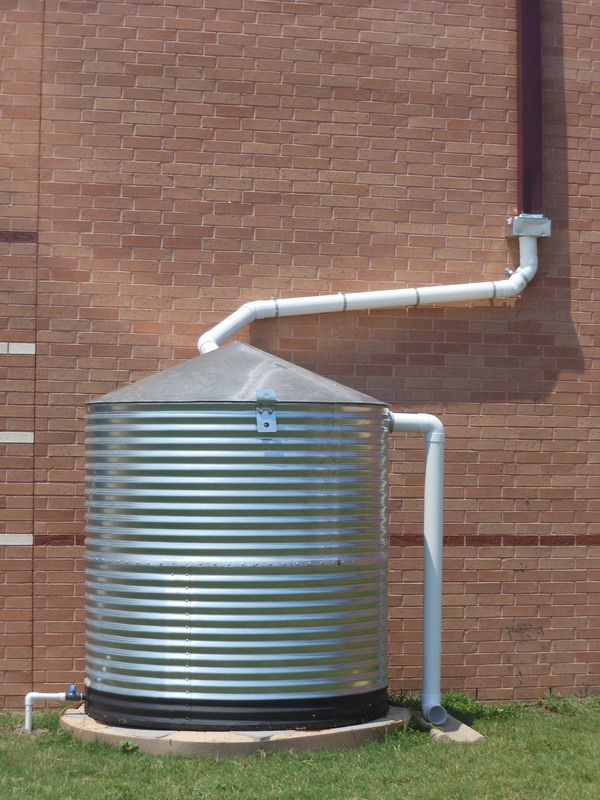 A cistern for collecting rain water. Water Quality: Most of the bayous and creeks in our area have degraded water quality according to the Texas Commission on Environmental Quality. This degradation is the result of our everyday actions but there are ways to mitigate these activities. Collecting and filtering water running off the land in rain gardens and swales is an attractive way to improve water quality. 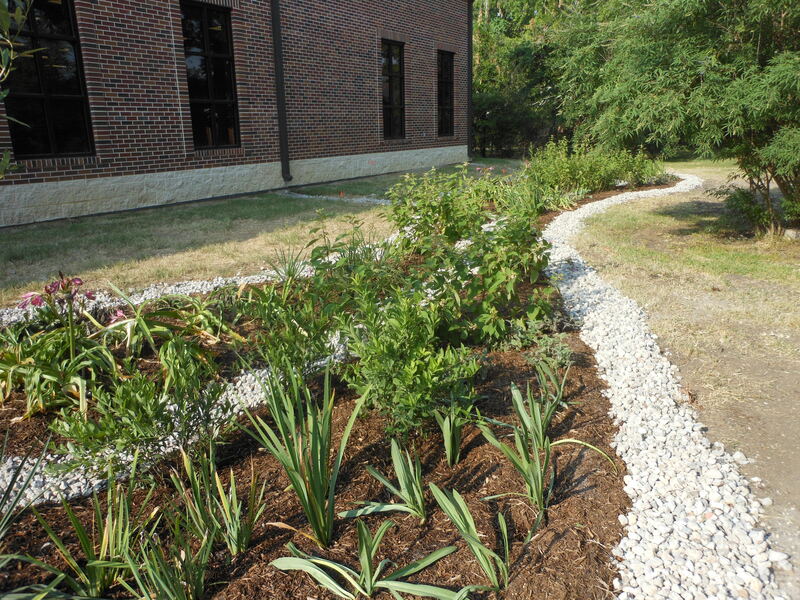 Rain garden at a local library. Habitat: Our expanding communities take up more and more open area every year, making it harder for wildlife to find a home. Including native plants and water sources in the park provides food, water and shelter for butterflies, dragon flies, hummingbirds, and song birds. This Park is funded by the City of League City and grants from the Texas Commission on Environmental Quality and the Galveston Bay Estuary Program.